Despite the breathtaking progress in medicine, the chances a person living to the age of 106 are remote. Particularly so for men. Imagine a 106-year-old man who actually saved the lives of 669 children. 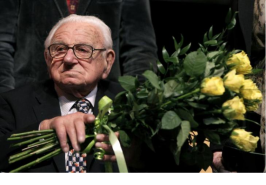 Sir Nicholas Winton is such a man. Born on May 19, 1909, Sir Nicholas is responsible for having conceived and organized one of the most imaginative life-saving operations known by mankind, just before WWII broke out. Winton’s parents were German Jews who had moved to the UK and converted into Christianity before he was born. Back in 1938, Nicholas was a young and successful stock broker at the London Stock Exchange. On the eve of Christmas of that year he was about to embark in a holiday trip to Switzerland, but a call from his friend, Martin Blake, made him change his plans. The latter was working for a refugee aid committee in Czechoslovakia and was asking for assistance. The young Winton did not hesitate. He called off his scheduled vacation and traveled to Prague, answering his friend’s call. While in Prague, Winton immediately understood the looming threat posed by the Nazis and he embarked on a relentless effort to save as many Czechoslovakian children as possible. He started to contact various relief organizations in the UK with the aim of finding foster homes for the children. He even wrote a poignant letter to US president Franklin Roosevelt, urging him to do something for the children of Czechoslovakia. Unfortunately, America failed to act. On November 21, 1938, shortly after the Nazi pogrom (wrongly known as “Kristallnacht”), the House of Commons adopted a resolution that would allow the influx of young foreign refugees, as long as they had a place to stay in the UK and some money as collateral. By then, the Nazis had occupied the Sudetenland and Sir Nicholas had the foresight to understand what would be the tragic fate of the Jewish children. Winton took up the challenge and after nine months of sleepless nights and nerve-racking days, he managed to evacuate 669 Czechoslovakian children (most of them Jewish) from Prague on trains to London. He was also instrumental in the monumental efforts to identify British foster families for the young refugees. Oftentimes heroes are modest people who do not like to brag about their feats. Winton did not share his awe-inspiring exploits even with his closest friends and relatives. In fact, it was just by chance that back in 1988, his wife Grete found a scrapbook in the attic of their home. The document contained a list of the evacuated children, including their parents’ names and the names and addresses of the foster families. That is how the world became aware of the existence of this hero, and of his riveting story. Most of Winton’s children have created their own families, so that the Winton extended family has now thousands of members who actually own their lives to this admirable man. In 1983, Winton was appointed Member of the Order of the British Empire (MBE) by Queen Elizabeth, and ever since, a great number of honors were bestowed upon him. We had the privilege of meeting Sir Nicholas on June 27, 2013, in London, in our capacities of chairman and founder, respectively, of the International Raoul Wallenberg Foundation. He was “only” 104 at that time, but his mind and eyes had a unique, unforgettable spark. His optimism and sense of humor left us feeling that we were in front of a person larger than life. We chatted quite a lot with him, and bestowed upon him the Raoul Wallenberg Medal. He was deeply moved, and so were we and all those who were with us, including former UK prime minister Gordon Brown. Our joy in meeting Sir Nicholas was somewhat marred by the realization that Raoul Wallenberg was only three years his junior. Had the latter not been abducted by the Soviets, both giants could be holding a “rescuers’ summit” and discussing how to prevent further atrocities. The fact is that Sir Nicholas Winton is still with us and we wish him many more years of good health and lucidity. We have a lot to learn from him, and much to thank him for.